Figure 5.10. Ratio of total propellant weight to satellite weight for two electric propulsion systems..
figure is 190.5 kg of propellant per kilogram of LEO propellant delivered), the future holds a dramatic reduction in that quantity by a factor about 20 just by using hydrogen/oxygen propulsion in space, and using a combination of hydrogen/ oxygen rocket and airbreathing propulsion for the launcher. 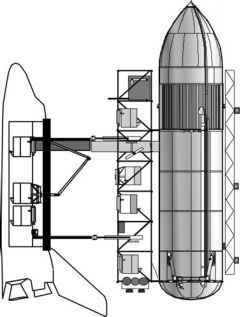 With space electric propulsion and hydrogen/oxygen rocket plus airbreathing propulsion for the launcher that ratio can be reduced to 1 or 3 kg of burnt propellant per kilogram delivered to orbit. The orbital tanker is now competitive with a KC-135 or modified B-767 for refueling missions.